Children in the Primary 3 and 4 Monday and Wednesday class have been learning about adjectives and adverbs and we used the opportunity of Carnival to practice using them. The first stage was to identify Carnival related vocabulary and we did this as a whole class activity – miming some of words to reinforce memory (for example band, music, parade, walk, march). The children then worked in three groups, “Horses”, “Dogs” and “Rabbits” to create their own pictures of Carnival using the vocabulary that we had identified. 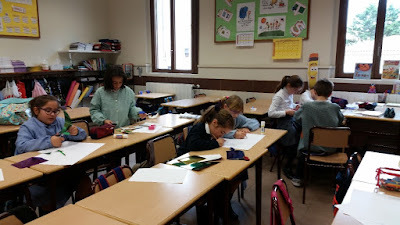 Els nens de 3r i 4t de primària del grup de dilluns i dimecres han estat aprenent els adjectius i els adverbis, i han utilitzat l'oportunitat de Carnaval per a practicar-ne l'ús. El primer pas va ser identificar el vocabulari relacionat amb Carnaval i ho van fer a través d'una activitat de tota la classe- fent mímica amb algunes paraules per a reforçar la memòria (per exemple: banda, música, rua, passeig, marxa). Aleshores, els nens van treballar en tres grups: "els Cavalls", "els Gossos" i "els Conills" per a crear els seus dibuixos de Carnaval utilitzant el vocabulari que havien identificat prèviament. Here they are focussed on their task. Aquí els trobem concentrats en les seves tasques. 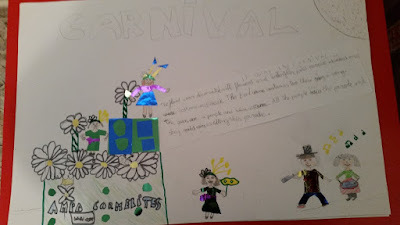 For the second stage, as whole class activity, the children identified appropriate adjectives and adverbs to describe Carnival. Then, because Carnival had already happened we used the opportunity to learn about using the past tense. Per al segon pas, i com a activitat de grup-classe, els alumnes van identificar els adjectius i adverbis apropiats per a descriure el Carnaval. Aleshores, i ja que el Carnaval ja havia passat, van utilitzar l'oportunitat per aprendre a utilitzar el passat. For the third stage the children worked in their groups and wrote descriptions of their pictures. Per al tercer pas, els alumnes van treballar en grups i van escriure descripcions dels seus dibuixos. Here is the picture made by the “Rabbits”. Aquí tenim el dibuix fet pel grup dels "Conills". “It was in Carnival. The float was decorated with flowers and butterflies and people danced and wore costumes and masks. The band wore costumes too. They sang a song. The queen wore a purple and blue costume. All the people saw the parade and they said it was exciting”. "Va ser Carnaval. La carrossa estava decorada amb flors i papallones i gent ballant i que portaven disfresses i màscares. La banda també portava disfresses. Ells cantaven una cançó. La reina portava una disfressa lila i blava. Tota la gent va veure la rua i van dir que era fascinant." Finally, here we have them describing their picture in front of the class. Finalment, aquí els tenim descrivint el seu dibuix davant de tota la classe. Our P4 and P5 students are working on the animals, and last week they listened to a short story called What do you see? In it, they saw and imitated different animals, as we can see in the video. They had a great time! Els nostres estudiants de P4 i P5 estan treballant els animals, per això la setmana passada van escoltar el conte Què veus? En ell van veure i imitar diferents animals, tal i com podem veure al vídeo. S'ho van passar molt bé!